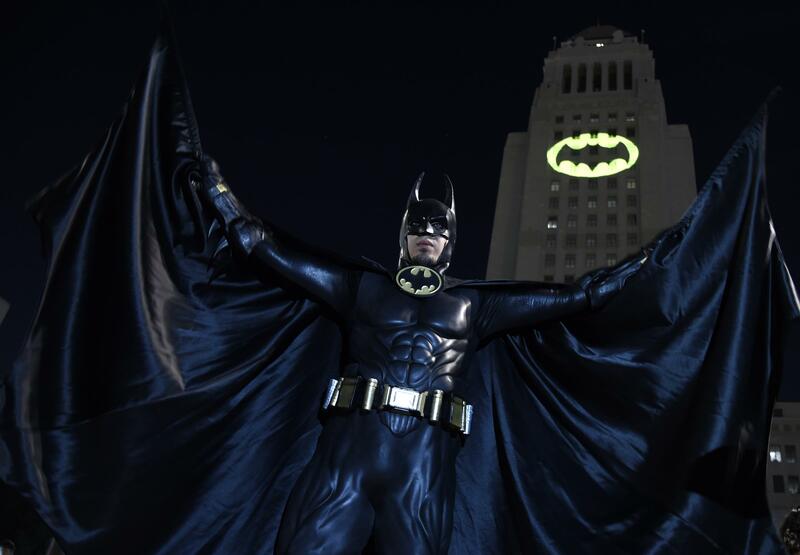 Caeser Saend, of Los Angeles, poses in front of a Bat-Signal projected onto City Hall at a tribute to "Batman" star Adam West on Thursday, June 15, 2017, in Los Angeles. "I was born a nerdy child," Langley confessed wryly. "Seriously, my baby book shows that Batman was one of my earliest words. We have this wonderful photo of me at age nine months, holding one of my mom's comic books and just looking delighted by it." Langley turned that delight into a way of teaching his students at Henderson State University in Arkansas, using Batman and "The Walking Dead" to illustrate difficult and sometimes painful issues. Langley is appearing at Illinois State University this week to deliver a series of talks regarding psychology and popular culture. He's also featured in "Legends of the Knight," a documentary about people who are inspired to overcome obstacles and embrace their inner superhero through their love of Batman. It's showing at the Normal Theater at 7 p.m. Thursday, and Langley will take part in a panel discussion following the film. "A lot of things came together for me 10 years ago. I was teaching a psychology and literature course that summer, and what I found was that students were really having fun with the material. We were analyzing characters like Hamlet. And they were having fun with the material and learning the psychology really well. It was a powerful thing, using these fictional examples for them to learn about the psychology of real people." "And this was very much in my mind as I attended my first San Diego Comic-Con that summer. I spoke with comic scholars, thinking about the fact that very little had been written in psychology in the past 50 years related to comics and superheroes. So it used to be the nerdy side of my life and the professor side of my life were two separate things, and that's when I knew that these must be the same thing." Langley was determined to write an article about Batman. That article soon expanded into a well-received book, "Batman and Psychology: A Dark and Stormy Knight." "And over the course of time, I've been using these things to teach. English professors get this. Fiction has to be truer to human nature to convince the audience and can get to the essence of what's going on." Langley noted that individuals can often take a harder look at real life through a fictional examples because we step aside from our own predispositions and the feelings that might evoke. "Star Trek," back in the 1960s, was able to explore real-world issues in a way that nobody else on TV was doing because they would talk about civil rights issues, but through fictional species. "When I teach forensic psychology, the psychology of crime, some of those topics can be so unpleasant and disturbing that the people I'm talking to miss the point I'm getting at. I can talk about the same things we know from real crime victims, but through a fictional example like Batman, as a child seeing his parents murdered, and they stay with me through what I'm talking about." In addition to authoring "Batman and Psychology: A Dark and Stormy Knight," Langley serves as editor of a series of books on pop culture and psychology for Sterling Books. The book topics range from Captain America to Dr. Who to "The Walking Dead." His latest effort focuses on the popular TV series, "Supernatural."